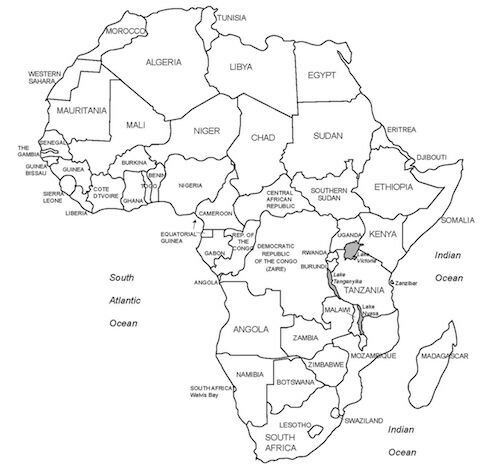 Map of Africa. Madagascar is located off the east coast of the continent. Image courtesy of Pinterest. assume that humans have been living on this island since the dawn of time. If by that you mean some 2,300 years ago you would be correct. Our friend Lucy, however, lived more than 3 million years earlier on the continent of Africa. So did many other early hominids. None of them ever saw Madagascar. Instead, the people who finally settled there were people like you and me: Homo sapiens sapiens. The world they walked into was inhabited by creatures long extinct elsewhere , or even never extant elsewhere. The composition of the wildlife of Madagascar reflects the fact that the island has been isolated for about 88 million years. The prehistoric breakup of the supercontinent Gondwana separated the Madagascar-Antarctica-India landmass from the Africa-South America landmass around 135 million years ago. Madagascar later split from India about 88 million years ago, allowing plants and animals on the island to evolve in relative isolation. The first humans finally arrived in the fourth century BC, roughly the time Alexander the Great took on the Persians. I can hear people saying: “Got it. For sure these settlers came from Africa, right?” And they would be wrong. These first settlers did not come from Africa, as might be expected, given the geographic proximity of Madagascar and Africa. Instead, we learn that “all Malagasy individuals share recent Austronesian and Bantu ancestry” and that current research suggests that “Indonesian populations may have arrived on Madagascar before African populations.” It is hard to imagine what made people decide to leave their islands in Indonesia and undertake this epic voyage east. A second wave of settlers, this time from Africa, came to Madagascar around 500 – 700 AD. 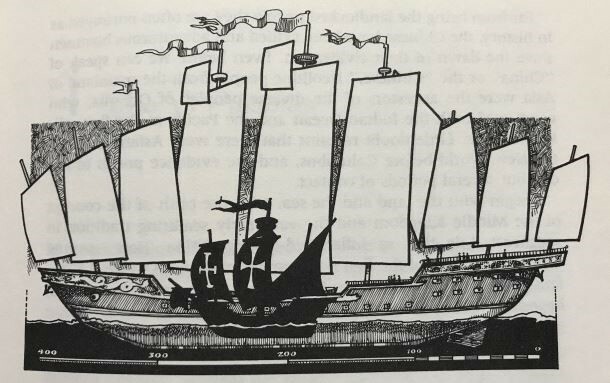 Speaking of sea voyages: eighty years before Vasco da Gama’s arrival in West India, a formidable Chinese navy sailed the China Sea and Indian Ocean, from Southeast Asia to the Persian Gulf and East Africa. Between 1405 and 1433, China’s Ming dynasty launched seven voyages led by Admiral Zheng His mission was to explore these vast regions, known then to the Chinese as the “West Oceans.” One such voyage typically featured over 300 vessels, including a number of “treasure ships” over 400 feet long, accompanied by a legion of supply ships, water tankers, warships with canons, and multi-oared patrol boats; the total personnel on the fleet numbered over 28,000. As has been pointed out in article like this one, “It was a unique armada in the history of China— and the world—not to be surpassed until the invasion fleets of World War I sailed the seas. Consider not only the dates, but also the difference in ship dimensions: the imperial vessels were longer than a modern soccer or US football field; they were also between four to five times the length of Columbus’ Santa Maria, which sailed some 80 years later. Then there is the ever evolving assessment of the ancient Maya. When in the 1820s a wave of independence movements gave Spain the boot, the United States sent envoys to establish relationships with these new countries. When these individuals, who were part diplomat, part explorer, returned, they brought with them tales of mysterious cities, hiding in the jungles of what is now Guatemala and neighboring countries. Initial interpretations of who might have lived in these cities suggested we were dealing with a very rare phenomenon: peaceful kingdoms. These early explorers imagined a priestly class dispensing wisdom from temples situated high up on pyramids and farmers bringing offerings in return for divine guidance. There was respect for life, human, animal, even plant. All was peaceful. Or so we thought. Close to two centuries later, we now know that, sadly, but predictably, the ancient Maya behaved like any other group of humans… sometimes excelling in art, architecture, writing, and sometimes subjecting their fellow human beings to the most unimaginable violence. There is now a growing list of Maya fortified sites, a tell-tale sign that not everything was always tranquil in Mayaland. 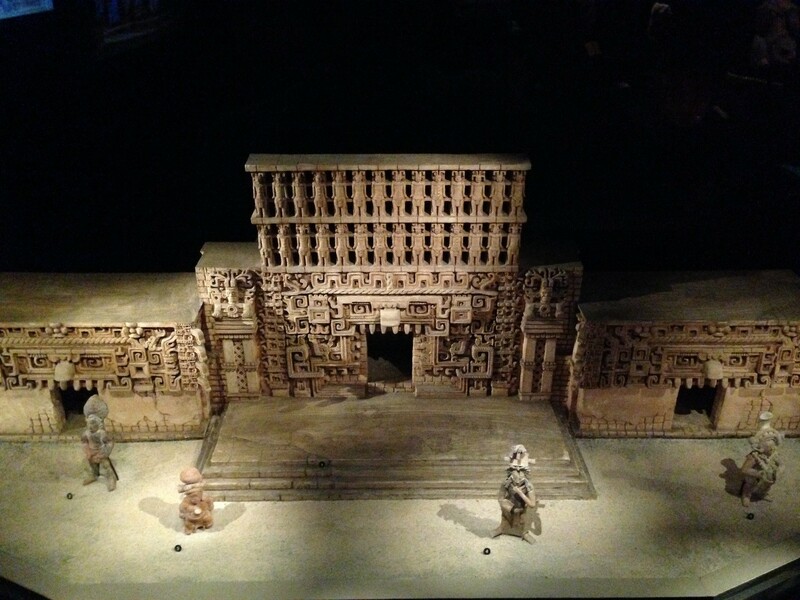 A scale model of a Maya temple and Jaina ceramic figurines on display in the John P. McGovern Hall of the Americas at the Houston Museum of Natural Science.